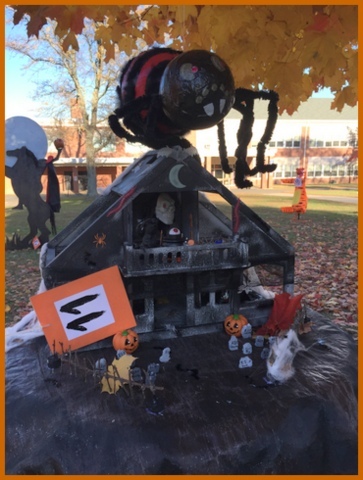 I’ve always loved fall and Halloween, but it’s an extra-special time in the New England hamlet we call home: on Halloween there’s mobs of goblins who trick-or-treat along our historic Main Street. 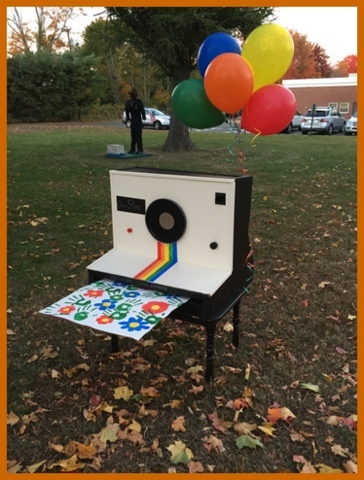 Others trick-or-treat along neighborhood streets as friends greet each other, and everyone delights in seeing the kids’ costumes. Each October, we look forward to seeing pumpkins on porches, corn stalks on railings, and eating pumpkin ice cream at the local creamery before it closes for the season. 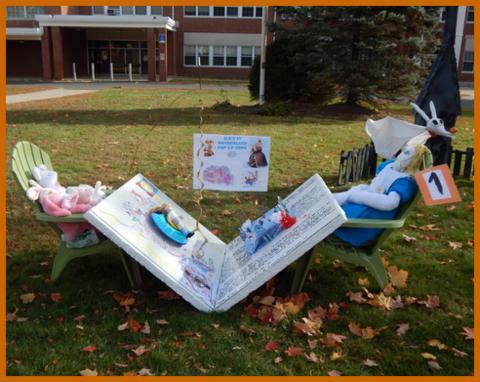 There’s another very special tradition in our town that folks look forward to, happening each year around Halloween – it’s the Annual Scarecrow Project! 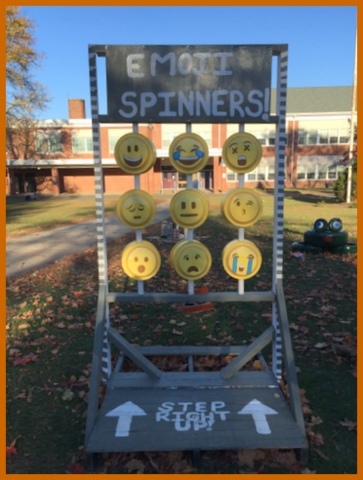 The creations are made by eighth graders at our local middle school. 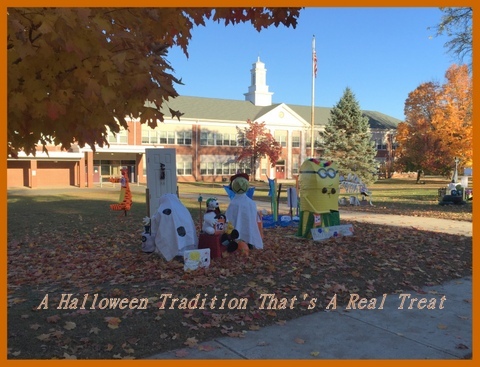 Each year, groups of three or four kids meet once after school, then design and submit plans for their scarecrow. 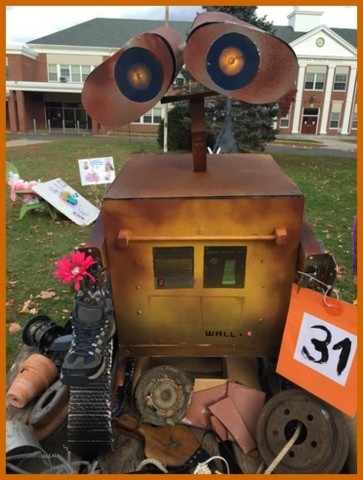 They are then given a few weeks to take their designs from paper to larger-than-life creations that grace the front lawn of the school. 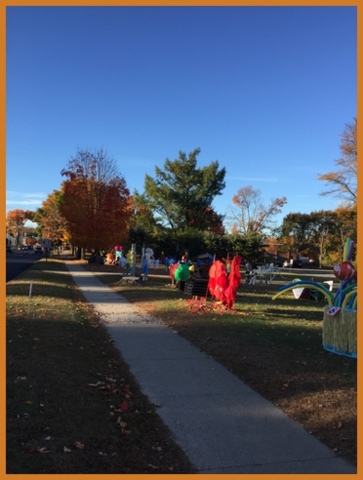 Everyone looks forward to the week before Halloween, when the scarecrows go on display along the busy tree-lined street. 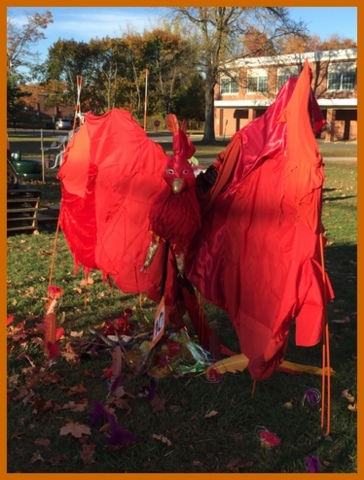 An extracurricular activity, my daughter was thrilled to be an eighth grader this year because it meant she could finally participate after admiring the displays each year since she was small. There’s no gore, guts, or violence allowed, and ideas must be approved before the students go forward with their entries. 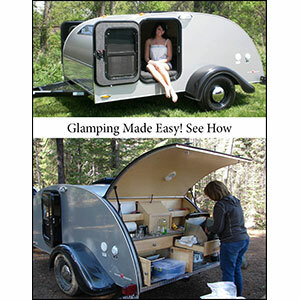 The creations must be sturdy enough to “withstand the wrath of Mother Nature”. 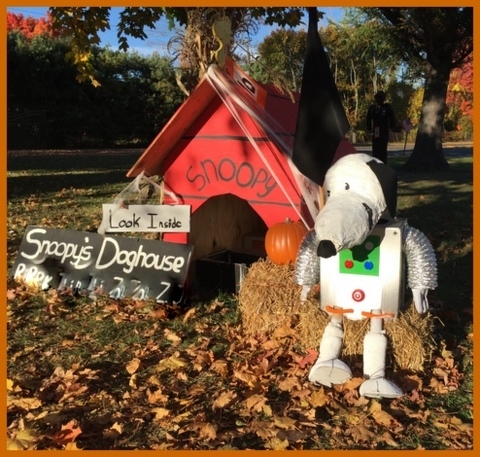 You never know what the kids will dream up – from classics like haunted houses or the Peanuts gang, to pop culture characters and everything in between. 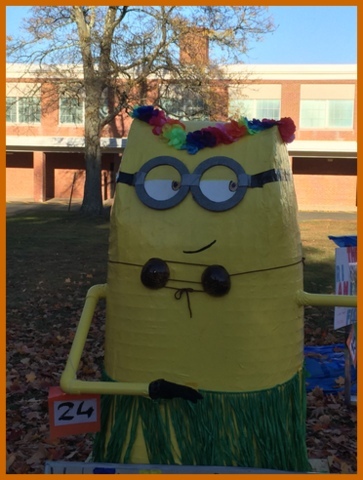 The town buzzes with excitement to see the scarecrows standing in the schoolyard. 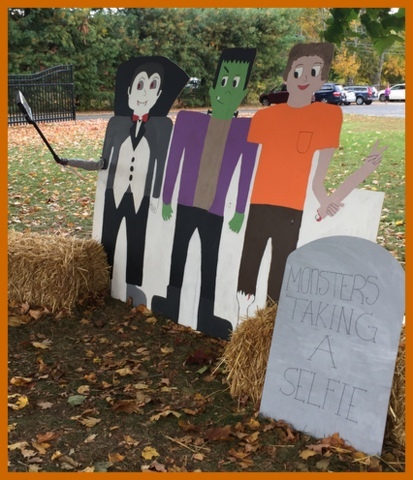 A twist on classic monsters – these characters are taking a selfie! 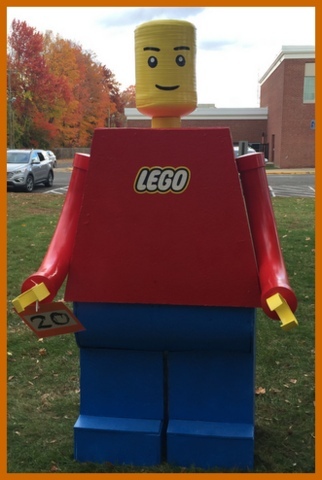 Here’s a VERY large LEGO man! 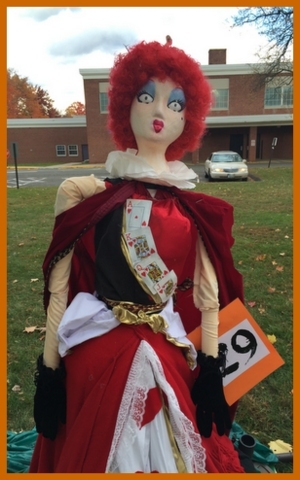 This scarecrow’s a larger than life blast from the past! The figure in the back is a likeness of Kanye West. 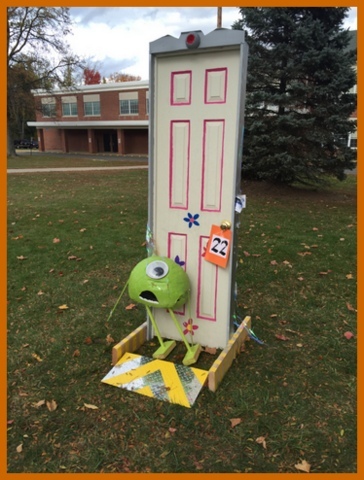 This year’s creations didn’t disappoint – from Alice in Wonderland and the Cheshire Cat, to more modern references like “Monsters, Inc”., one thing they have in common is that they are all impressive! 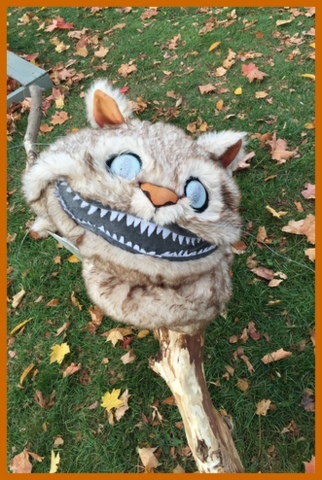 Don’t ya just adore the face on this Cheshire cat? 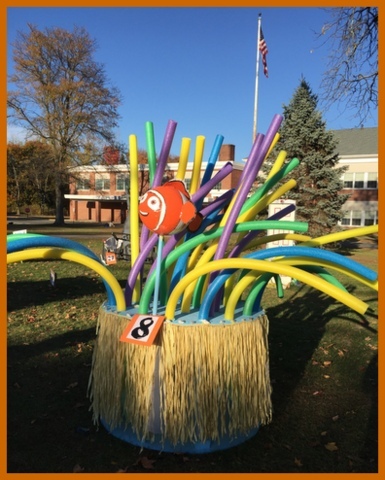 Originally the brainchild of former middle school teacher and current Board of Education member, John Vouros, this year marks the tradition’s eighteenth year. 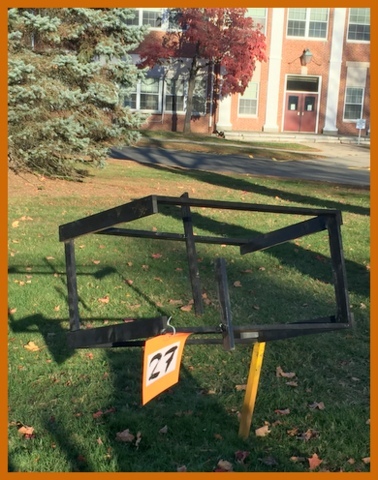 On average, close to one-hundred students choose to participate in the event. The single meeting is held at school in early September. 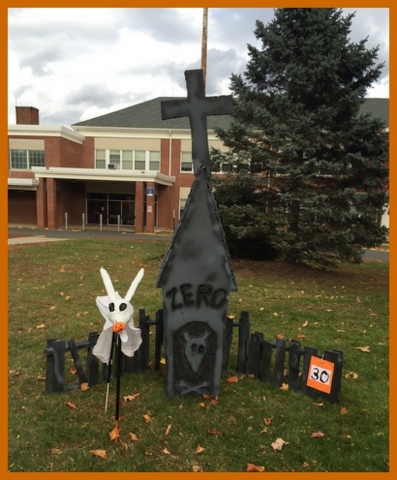 The rest of the work is done independently with their group members off-site, until the Friday in October before Halloween when students and their families install the scarecrow on the school’s front lawn. This was made in honor of the Peanuts’ 65th anniversary. My daughter’s group created a rendition of the Headless Horseman, complete with battery-operated lights that glow when it gets dark. For several weeks the kids got together to work on the project; seeing their dedication and design come to life made us parents so proud. 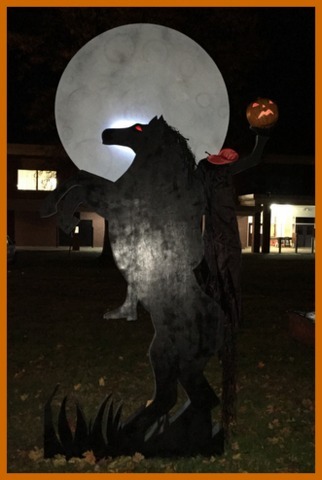 Around eight feet tall, the kids had to go back to the drawing board several times to bring their vision of the horseman in silhouette of the moon to life. Each creation is assigned a number. 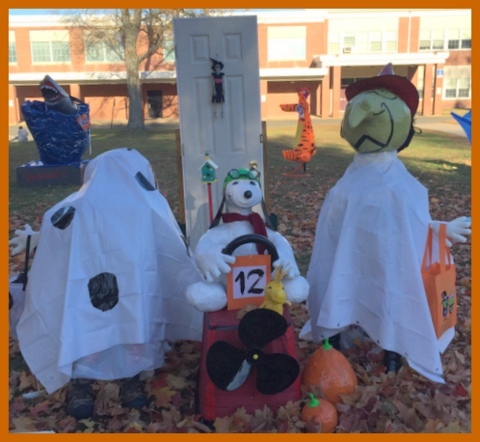 Visitors to the display can vote for their favorite scarecrow for $1.00 a vote. Kids who participate in the event must volunteer time manning the voting table (along with a few parent chaperones). It’s nice to see the kids working together, admiring and complimenting each others’ work. The money collected is used as prize money, presented to the winning team’s charity of choice. Last year, over $1100 was raised and given to charity, with this year’s numbers projected to be about the same. Usually, the students choose local charities like the local food bank, but often charities on a national level are selected, as well. The whole event fosters a true sense of community. 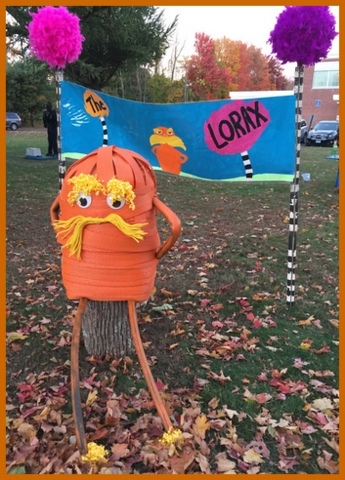 and a Lorax that would make Dr. Seuss himself proud! 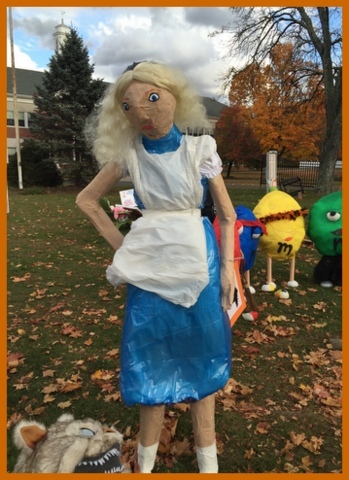 The vision, creativity and genius use of materials for all of the scarecrows is really inspiring. It’s recommended that students stick to a budget of no more than $25 total for supplies. A re-purposed dollhouse becomes a haunted home. 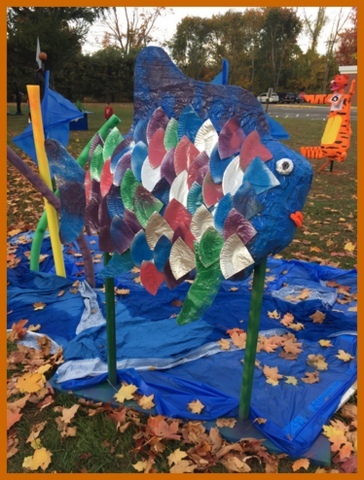 A rainbow fish uses plates as scales and a tarp for water, while Tigger stands in the background. Wal-E looks like he walked right off the movie set! For the contestants, there’s a lot of work involved, but it’s so worth it. 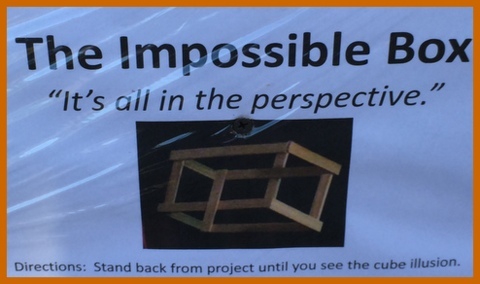 Students master skills needed to work with a group, use their imagination and dedication to see a project evolve from start to finish, manage time, and be responsible to meet deadlines. 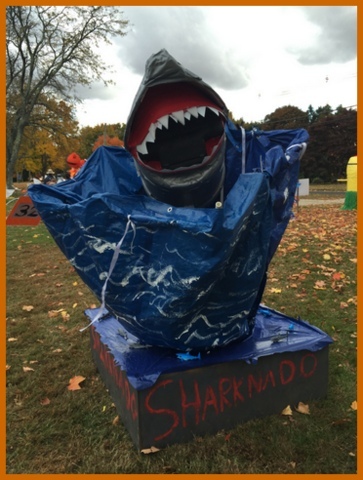 Most of all, it is a fun activity that benefits a good cause while bringing people together. 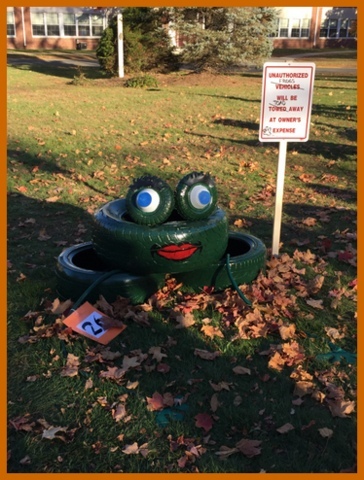 The smiles of visitors to the display are contagious, and the hard work that all of the kids who participate in the contest is illustrated in each and every entry. It’s a tradition everyone from town looks forward to. It really doesn’t matter who “wins” – they are all winners! 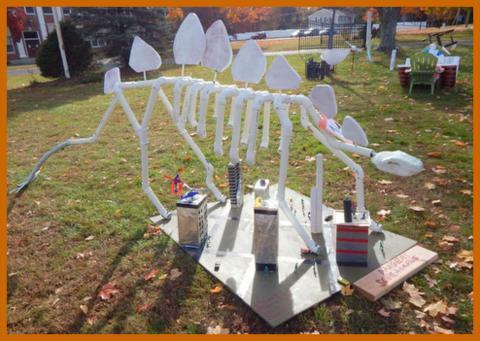 Aren’t these eighth-graders creations really something? Give a shout out to them in the comments, below! Do you remember your first “wheels”? 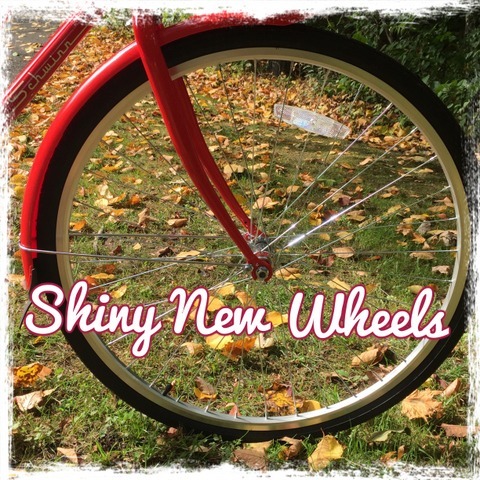 Before my first car (an old beat up thing, that even as a “vintage” car was the ugliest automobile I’ve ever seen), I still remember the excitement of a new bicycle.